Woman with smartphone and white hairy dog. Hairy chihuahua an her master sitting on bench. Three dogs are following their master. Three leashed chihuahuas are following their master in slow-motion. A little girl with her pet chihuahua dog. 27. 05. 2017 - Kyiv, Ukraine. Woman is leading her dog up. Woman is leading her chihuahua up to A-frame plank. 27. 05. 2017 - Kyiv,Ukraine. Little dog is climbing. Chihuahua is rediculously climbing. Chihuahuas behind the fence. Close up of group of dogs playful with hands caressing. Dogs are lovely looking up at their owner. 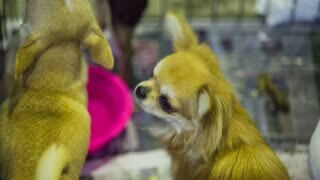 Chihuahuas are lovely looking up at their owner. 27. 05. 2017 - Kyiv,Ukraine. Dog is going up the ladder. Chihuahua is going up the ladder with help of the owner. The view from the window from the Cheep train of the forest with sun backlight, Barrancas del Cobre, Chihuahua, Mexico. View of the moon from a moving train, Barrancas del Cobre, Chihuahua, Mexico. View of the Cheep train passing through a forest, Barrancas del Cobre, Chihuahua, Mexico. The Cheep Express train arriving to the Divisadero train station, Barrancas del Cobre, Chihuahua, Mexico. Aerial orbit shot of the Piedra Volada in Divisadero, Copper Canyon Region, Chihuahua. Aerial shot of a rock formation in the Urique Canyon in Divisadero, Copper Canyon Region, Chihuahua. Aerial drone shot of the Urique Canyon in Divisadero, Copper Canyon Region, Chihuahua. Aerial shot of a cable car in the Urique Canyon in Divisadero, Copper Canyon Region, Chihuahua. Aerial drone shot of the Urique Canyon and a hotel in Divisadero, Copper Canyon Region, Chihuahua. Aerial shot of the epic Urique Canyon at sunset in Divisadero, Copper Canyon Region, Chihuahua. Aerial pull back shot at and the Urique Canyon in Divisadero, Copper Canyon Region, Chihuahua. Aerial wide shot of the Urique Canyon in Divisadero, Copper Canyon Region, Chihuahua. Aerial pull back shot of a cable car in the Urique Canyon in Divisadero, Copper Canyon Region, Chihuahua. Aerial shot of a hotel in the Urique Canyon in Divisadero, Copper Canyon Region, Chihuahua. Aerial shot of rock formations and the Urique Canyon in Divisadero, Copper Canyon Region, Chihuahua. Aerial drone shot of a hotel in the Urique Canyon at sunrise in Divisadero, Copper Canyon Region, Chihuahua. Aerial shot of a adventure park and the Urique Canyon in Divisadero, Copper Canyon Region, Chihuahua. Aerial shot of Piedra Volada and a the park at Divisadero, Copper Canyon Region, Chihuahua. Aerial dolly in shot from a hotel with the sun rising in Divisadero, Copper Canyon Region, Chihuahua. Aerial shot of the epic Urique Canyon in Divisadero, Copper Canyon Region, Chihuahua. Aerial shot of the Urique Canon in Divisadero, Copper Canyon Region, Chihuahua. Aerial wide shot of the Urique Canyon at sunset in Divisadero, Copper Canyon Region, Chihuahua. Aerial wide drone shot of the Urique Canyon and a hotel in Divisadero, Copper Canyon Region, Chihuahua. Aerial shot of a cable car leaving the station in the Urique Canyon in Divisadero, Copper Canyon Region, Chihuahua.